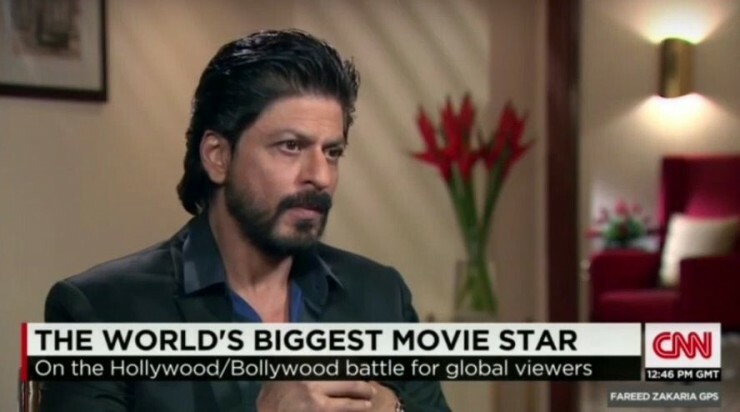 CNN, one of America’s biggest news channels, introduced Shah Rukh Khan as the World’s Biggest Movie Star. 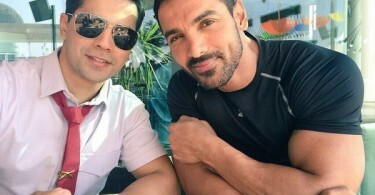 In an interview with the channel, the actor spoke about the battle between Bollywood and Hollywood, and also discussed about the star system back home in India. Khan added that it would take quite a while before international cinema becomes actual competition to Indian films. “But like I said, Indian cinema is changing so fast with all the young actors and actresses. So, it will be quite a while before international cinema becomes actual competition” Shah Rukh said. In his inimitable style, the ‘FAN’ star said that unless Hollywood films have six songs, they won’t be competing against Indian films. However, he was quick to add that if the industry is not quick enough to change our brand of cinema, it risks serious competition from Hollywood films. “We are the only country where local cinema does better than international cinema.. But I have always had this worry, if I may say so, that if we are not able to change our cinema quickly enough, then we would be kind of overtaken, like Hollywood has. Principle movies all over the world are Hollywood films” Shah Rukh said. The acclaimed actor is gearing up for the release of ‘FAN’, where the lead protagonist plays the fan of a character based on Shah Rukh’s life. The teaser of the film had the words ‘duniya ke sabse bade superstar ka sabse bada fan’. Any doubt haters.. If u have doubt then please wait till April 15.. we have to prove something.. Please wait…..
Hahahaha biggest joke of the century. Can’t even give a huge hit in India, still struggling to cross 210 cr while Salman and Aamir has already crossed 320 cr mark. Have no 450 cr+ worldwide grosser, Salman and Aamir has 630+ grossers. And then CNN calls SRK a biggest movie star on earth? I mean he’s not even India’s biggest star forget worldwide. Tom Cruise, Robert Downey Jr., brad pitt, Arnold, Stallone toh jaise exist hi nahi karte. LOL. You’re saying it’ll take Hollywood a lot of time to beat Bollywood. But sir.. Fast and Furious 7 collected just 30 crore less than your biggest release Dilwale without getting Christmas holiday advantage. I think Furious 7 could have proved to be tougher competition for Bajirao Mastani.. more than Shetty’s entertainment at 100 miles per hour. Any doubt about that?????? NOT AT ALL. Indicine, you made my day with that headline. cmon haters now say SRK ne CNN ko bhi kharid liya..!! Lol.Thats why detained at usa airport. Srk is the biggest star of the world..comparisons r going on with world cinema… Srk’s fan is what i m looking forward to ..
International cinema like X men apocalypse are releasing in May month ..but it is not going to affect Azharuddin biopic..
Srk has given clear view about world and indian cinema. We are the only country where local cinema does better than international cinema. True! Do they watch Bollywood movies? Self proclaimed biggest star. I dislike him more now. I do not want to say anything about srk because haters will think i am doing this because of i am a srkian. In fact, you accept or not what this article has said is really true. Get a life, on the whole planet SRK is recognized as the biggest superstar ! Sallu is a local star doing b-grade action flicks. King Khan is a worldwide superstar with cult classics in his filmography. ‘FAN’ will silence every hater, because it won’t be about box-office but about content.